Mahahual, Mexico – palms waving in the ocean breeze, restaurants on the beach, rich sights under the waves for snorkelers, and every souvenir imaginable. Also, broken brick houses, children living in poverty, heat and humidity and bugs. Also, friendly greetings for locals and visitors alike, kids playing soccer and basketball in the evening, tacos on the street for only a dozen pesos, and a few dozen places to get a drink for less than a bottle of water. 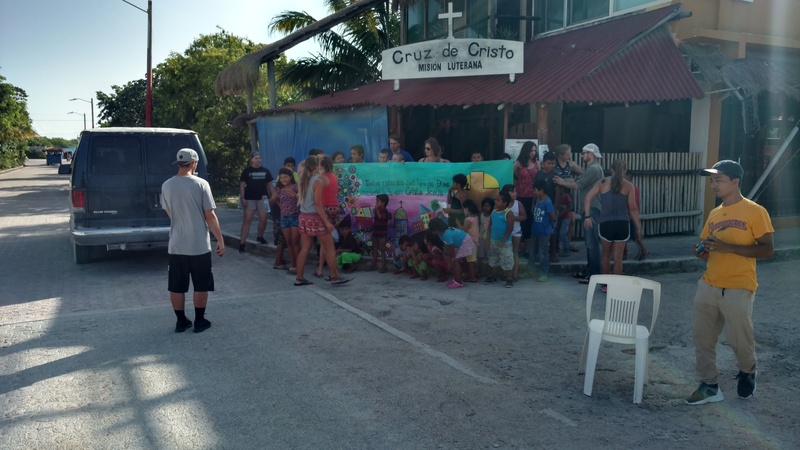 Cruz de Cristo, the Lutheran mission in Mahahual – perhaps the only place in town, other than your own home, where a person can hear about Jesus every week. Also, a place where children are not only welcomed, they are picked up in vans and brought to the mission so that they can hear about Jesus. Also, a place where the needy are welcomed every Friday for a bowl of soup or a sandwich, feeding their bodies as well as their souls. It is a joy to worship and serve alongside the brothers and sisters in the faith in Mahahual. This summer, we put together a program to bring Bible stories and English classes to the children. With dedicated volunteers from Minnesota and Wisconsin serving on rotating teams over four weeks (and two rock star college age teachers serving for the duration), we ended up adding to that an art camp, sports down at the community center, garbage cleanup on the streets of the town, and donations of clothing and hygiene and educational supplies. What we came here to give, however, is only one side of the coin. Equally valuable is that which we received. It is impossible to do mission work in a place like Mahahual and not be changed by it. It’s not always easy to put words to what that means, but there’s no doubt we feel the changes worked in us. But why are we doing this? What is the point, and what good is it accomplishing? Why this project in this place? As I look at the paragraphs above, I feel like they already answer those questions, at least in part. But over the next couple weeks I will be sharing about our experiences, what we’ve seen and done, the good we hoped to do and the evidence of what God has done through it. There’s a phrase in a Bebo Norman song about “the depth of human need.” He’s describing the power of God’s grace to find its way to the deepest part of every person, to fill every hole in a heart that is hungry for hope. Many times when people describe “human need” they are referring mostly to physical needs – food, clothing, shelter, medical care. But there’s a deeper need that we all have, that need for grace, for salvation. We need to know that we are loved in spite of the constant failures with which we are all too familiar. We need to know that we are loved when it seems that the whole world is against us. We need to know that we are loved when we feel completely unloved in any and every way. That is the depth of human need. But make no mistake – physical need can run pretty deep as well. In Mahahual there is an area of town known as “Kilometer 55.” Years ago many of the locals owned pieces of land in this area, and though they were the poorer people of the town, what they had was theirs and they did what they could to live off it. The Mexican government came in and convinced them to trade their land to the government in exchange for government built houses, and were promised working water, electricity, and septic. What actually happened was the people signed over the one thing that was actually their own, the government built concrete boxes barely big enough to fit a family of four or five, and after nearly a decade is only just now beginning to keep their promise of electricity. Water is collected in cisterns on roofs or makeshift platforms. If a family has a septic system of any kind they probably installed it themselves. The power comes from a massive bank of junction boxes at the edge of the area, which the people must connect to themselves and run their own electrical line to their home. What can a small Lutheran mission do for such a people? Well, we can make sandwiches. We can bring the kids and their parents over to the church, give them a good lunch, pray with them and give them God’s Word. We can invite the kids back the next day for a Bible lesson and some snacks, and we can give them a backpack stuffed with basic hygiene supplies and school supplies. Is it enough to make a major difference in their lives? Maybe not today. But is it enough to show them they are loved? Is it enough to open a door for the Gospel? Is it enough to show them the grace of God and to give them a chance at maybe knowing him, so that they have hope? Maybe. Si Dios quiere – If God wills it. But… El Señor es siempre bueno – The Lord is always good. So not “maybe.” God can and will work good from the work we do. We leave it to him what that good will be. We went to a place called Rio Indio for Bible study. It is run by a man called Gallo (pronounced “YAH-yo”, a sort of nickname for Gerardo), a gracious and friendly man who loves the Word, loves to study it and learn from it, loves to talk about his Savior, and enjoys speaking English to gringos (that last part was what he told me). He went around and got his friends and neighbors – including his boss, an old man called Santos – to come over for the Bible study. He was also very encouraging when us gringos read the Bible passages en Español. After Bible study we loaded up in the van, and the people from the Bible study helped prepare and serve the food at the soup kitchen. I say soup kitchen because that’s what it was called for a long time, though now they mostly serve sandwiches, chips, and granola bars. A member of the church drives around Kilometer 55 picking up children and some adults and bringing them over to get a meal. We had a prayer, we interacted and talked to them about Jesus, and we invited them to the Saturday kids’ program. Being here for such a short time, and only providing such small help can make one wonder if there’s really any good that can be done. The need is so great, and what can I do with just a few hours, just a few days? But I was able to tell a little niña about Jesus. I was able to build a relationship with a woman whose kids live in AZ, who really wants to learn English. I was able to remind a pregnant mom of three that God is good and will take care of her, even if she’s nervous and already somewhat overwhelmed. It helped to see men like Gallo and Pedro sitting nearby and reassuring her – men who seem like they carry in their heads and hands a wealth of know how. If she has something she needs, there are people ready to help. El Señor es siempre bueno. There are so many opportunities to help people here. Making the most of them, being truly helpful to them, sometimes it is hard to know what to do. But even the smallest effort is appreciated, and even if all anyone does is speak the Gospel to someone when they are ready to listen, perhaps they have planted or watered the seed that God is using to change not just that person’s life, but the lives of many others. Our first day in Mexico we spent some time sorting out supplies donated by our brothers and sisters in Bloomington. They sent flip flops, toothbrushes, tooth paste, coloring books, crayons, soap, and so on. Many useful things. We sorted them into little packages that we could deliver to children and families. Once that was done, we spent a little time picking up people who would join us, and a few other supplies, and went out to Pulticub. Pulticub is a seaside settlement north of Mahahual. The people there build their homes out of whatever they can scrounge together – tin roofing, fiberglass sheets, scrap boards, flattened soda boxes, etc. They survive mostly by eating what they can fish out of the sea or pull from a tree. But many of their young men will do random odd jobs for people with money, and then use the money to go into town, buy what they can from a general store, and then barter or sell it to the other villagers. A couple of people actually run little shops, which are almost indistinguishable from the other shacks in the village. Some of those young men also manage to get drugs and booze, which impacts the quality of life for everyone else there. We went into the village and gathered some people together for a Bible study and a meal. There were about ten kids, four women, and a couple of men. The missionary here presented them Law and Gospel from Genesis chapters 1-3, and watching the faces of these people, you could see a light coming on behind their eyes. They understood that there is a God – their lives are free from the intellectualism that plagues the civilized world and allows us to convince ourselves we’re too smart to believe he’s real. They understood that there is right and wrong – they have experienced human goodness and human wickedness in its various forms. Everybody gathered for the Devotion on Genesis 1-3. But they learned the weight of sin and its terrible consequences, and they learned the life giving truth that there is a Savior from sin. At least one young mother of two seemed to react with a small sense of awe at the understanding of Jesus’ love. A seven year old girl was delighted to the point of big smiles and an eagerness to hear more, and to sing about it. When we taught them the song, Alabare a mi Senor, she was eagerly repeating the words after the missionary. We had brought two chickens, some rice and potatoes, and pineapple. After Bible study, the women went into the kitchen – nothing more than a sand floor with three walls and a firepit, with cast iron kitchenware – and cooked up a meal. We ate it off of styrofoam plates, of all things (the villagers had a supply of them), but we had to use our fingers and tortillas. No utensils. After that we spent time playing with the kids, showed them how to put stickers (“stampia!”) up their arms and on their siblings’ faces. Put cross necklaces and bracelets on and colored together (“Crayola!”). Then we took some pictures together, had hugs and kisses all around, and we left. A young man named Eliseo. He was running the little store, but he wanted us to see the iguana he caught. To say these people are destitute would be inaccurate. They’re not just a few meals away from starvation. They aren’t disease ridden and filthy. They live by the ocean and can fish every day, and have access to fresh water from a nearby lagoon (and understand how to boil it for drinking). And it would be wrong to say they are primitive; they are familiar with things like radios and TVs and even computers and smartphones. But they aren’t inundated with these things. They don’t have a plethora of modern conveniences at their fingertips. Many are illiterate, and live by their own rules and customs. In some ways, this makes them very ready for the Gospel. They are not too busy to take time to hear the Word. They are not too learned to believe ancient truths. They are not too jaded to believe there is such a thing as absolute truth. They are not too immersed in tolerance to accept that Jesus is the only way. Giving out flip-flops. As one of our group members said, one thing seems to be familiar across all cultures – women and shoe shopping. So how are we going to serve the people in Pulticub, and other settlements in the area? Well, Cruz de Cristo is working on long range strategic plans right now for what is our best approach. Obviously, there are human needs we can work to meet, but we have to be careful to do things that are sustainable – that is, we don’t want to change their way of life significantly without a plan to support that change. But we can explore things that will help them live safer and healthier lives. Education is another great step, because it is a lasting investment. Most of all, of course, we will give them the Gospel. As we show them love we find open doors to bring them the precious truths of Scripture. Bringing them to Jesus is an eternal gift greater than anything money can buy, and the fruits that grow from faith will be a lasting blessing to their communities. The Lord is good. I am humbled that he has Called me to serve on behalf of his people. Even though it is often quite challenging, the fact that I can make a living out of bringing God’s Word to people and building relationships with them is pretty incredible. I’m thankful that God has allowed me to do this. And all the more so when he opens doors to exciting new ways to serve him and spread his Church! Recently I had a chance to visit Mexico’s Costa Maya region; some of you reading this already know that, but maybe you’re wondering why I went there, what the purpose was. In a nutshell, I was exploring opportunities for our members to do mission trips to that area, and how our congregation can support the mission there. After spending just five days there, I can say without a doubt that there is a ton of opportunity, and I am excited for what the future holds. Over the next few days I’m going to be sharing about why we’re working with this mission, what we did down there, and what’s coming down the road. Much of this is pull from stuff I journaled while I was down there, so I’m giving you a little glimpse of my day-to-day thoughts while on mission. Now, if you’re a member of St. Paul’s, I hope you’ll join me in getting super excited about this. Even if you’re not, I’d ask your prayers, and for you to consider being a partner for this ministry as well. For now, check out for yourself what Costa Maya Ministries is doing, and catch the video below, put together by Bloomington Lutheran. This week I have the joy of spending a week in Kansas with a group of six teens – four from St. Paul’s and two from Redwood Falls. We’re going to be helping St. Mark’s in Salina, KS with a week of sports camp, helping a bunch of middle school age children learn track and field skills, and hopefully also help them learn what makes Jesus so special to us and our lives. Sitting in church this morning was striking. Apart from it being a different church with a different pastor and different ways of doing things, what was most significant was the size of the congregation. Without us there it might have numbered 30 people. Yet it was evident they all were happy to be there, happy to hear comfort and encouragement from their pastor, happy to partake of the sacrament together, and happy to share some nice fellowship time together after church. Yes, the Lord is there among a small congregation too.